Man, I totally dicked about this morning for way too long. I blame the inn I was staying in – very historic building with creaky old floorboards and doors that are impossible to open quietly. When I checked in, dead beat and buggered, the clerk kept reminding me of the free breakfast at 8am. There was something appealing about a free breakfast. He mentioned pastries and I was sold. Now all this is fine and good and dandy, but as a result I didn’t leave Lexington until 10am. And you know what that means? It means that although it was a relatively short day of riding, I had to endure an absolute stinker of an afternoon. The morning was pretty sweet, simply because I was riding in more shaded lanes, next to bubbling brooks and whatnot. The afternoon I spent a good chunk riding next to an interstate and a railway line. I’m currently sitting in a picnic area at Camp Bethel. They let cyclists stay here, which is rad because they have a shower block. And I needed that shower. Aside from that, it was mostly an uneventful day. I bumped into a few chatty people, including a Vietnam vet at a gas station who recommended I stop in at Buchanan and try a crabcake. I did. I don’t regret it. I also waved down my first touring cyclist coming the other way, although I can’t for the life of me remember his name. I think he said it was Rick? He had come from Monterey and started in San Fran. His skin was nut brown and he looked fit as all getup. Told me he’d been doing 100 mile days since Pueblo, CO. I gawped a bit at that. I think he might just want it to be over, since he actually was pushing for Yorktown TOMORROW! 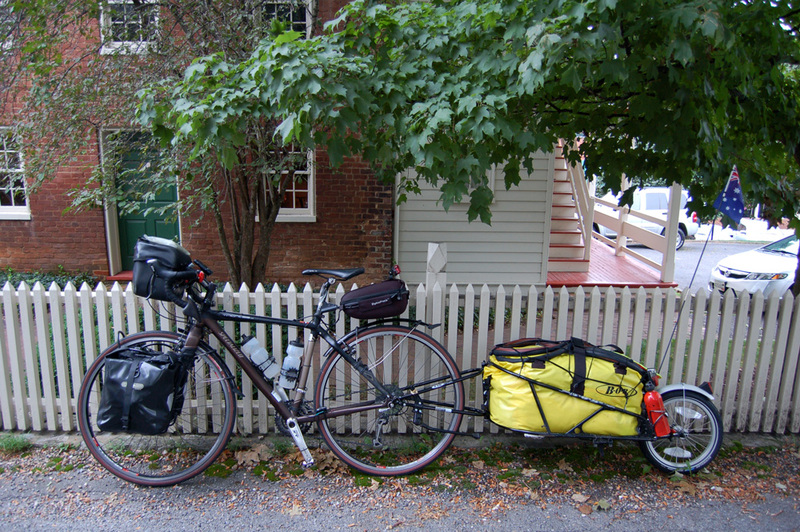 He told me that I was the first touring cyclist he’d seen in a long time going East to West. Just another way of saying “You’re leaving late”, which I hear nearly every day. But he wished me luck all the same. Early start tomorrow I think. It will be a longer mileage day, and I want to stop at a bike shop in Radford to get my gears tweaked. I tried to fix ‘em today but just made them worse. Have a feeling my derailleur is bent. Gotta go. Being eaten by bugs. They seem totally turned on by my laptop screen. Noodle, this is now my favorite blog. Swing down towards Phoenix and we’ll put you up. You rock it hard. Sounds (and looks) like you are on your way, have great time! Great to see you back out there, Noodle. I’ve had you on my RSS since the first time you headed out and am now looking forward to the completed journey. Don’t worry Janeen, you’ll be doing 100 mile days by the end too! Ride on! Love your commentary. You’re an inspiration and I’m blown away that you’re back at it so quickly. Don’t sweat the mileage, just enjoy yourself. You, quite simply. rock. What an awesome journey. Your photos are absolutey fantastic.